A total lunar eclipse will occur early on the morning of Wednesday, January 31. It's been given a variety of names, including "blue blood supermoon eclipse" and "super blue blood moon." Those titles are almost as intense as Die Hard with a Vengeance, but this eclipse has earned it. That's because the circumstances of this total lunar eclipse are extraordinarily rare. January's lunar eclipse will land on the night of a supermoon, making it nearly as large and bright as a lunar eclipse can be. (At least, when seen with the naked eye.) It is also the third in a line of three consecutive supermoons. It may have more titles than Daenerys Targaryen because there's still more to it. It's the second full moon of the month, which is popularly called a blue moon. By itself, a blue moon is less rare than the phrase "once in a blue moon" might have you believe. The phrase may be a more apt description of all these things happening simultaneously. This will be the first time there's been a "super blue blood moon eclipse" in more than 150 years, according to Space.com. A lunar eclipse occurs when the earth passes between the moon and the sun. 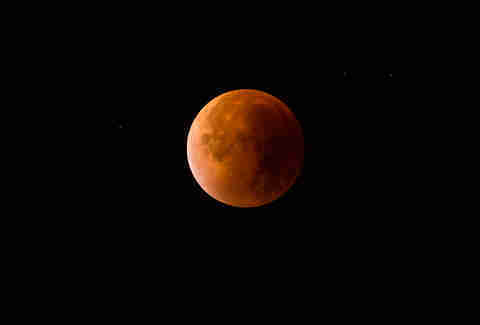 It turns the moon a reddish-brown color that can look quite spectacular. As mentioned, this lunar eclipse will be a supermoon. 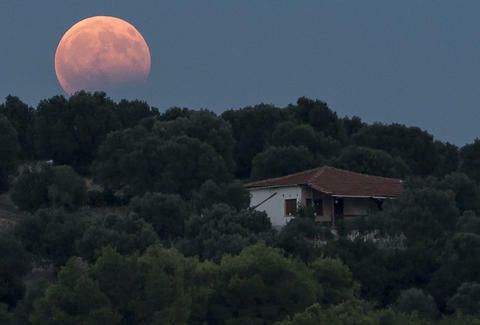 While there are some who don't believe a supermoon deserves its "super" title, the moniker exists because a supermoon is 14% larger and 30% brighter in the sky than a full moon at its apogee, the furthest point of orbit. This is because the moon's orbit is elliptical and in the moment of a supermoon, it's at the part of its orbit that brings it closest to Earth. Though, the anti-super label argument will hold no water until apartment superintendents are renamed mediocreintendents. In the continental US, you'll need to make a plan. According to a chart of when the eclipse begins and ends from Space.com, residents of the Pacific Time Zone will first see a partial eclipse at 3:48am. The total eclipse will last from 4:51am to 6:08am. In the Mountain Time Zone, the partial eclipse will be visible at 4:48am, with the total eclipse lasting from 5:51am to 7:08am. In the Central Time Zone, it's not going to be quite as good. The partial eclipse starts at 5:48am. The total eclipse kicks off at 6:51 and lasts until the moon sets around 7:36am. On the eastern seaboard, you're not going to have as much luck. The partial eclipse starts at 6:48am and the moon will set around 7:06am before the total lunar eclipse commences. For most of the country, it's going to be pretty easy to catch. So no excuses at work when you tell people you missed a perfectly good opportunity to see how amazing space is. Dustin Nelson is a Senior Writer on the news team at Thrillist. It's confusing in Minnesota because most people choose loon when you tell them about the loon or eclipse. Follow him @dlukenelson.